Winter has well and truly hit Melbourne, and with that in mind, I decided to share a few winter lip colours from discount brand Colour Theory! Colour Theory is a new Aussie brand, available in selected pharmacies, and I'm pretty excited about their new products! There's something about Colour Theory packaging that I really like. I love that it's clear and simple, which makes picking your preferred colour easy. Although, it could be considered a little tacky by some. I personally don't mind, though! Come winter time, I love to wear darker colours on my lips. It looks great with all my dark bulky winter clothing, and darker lip colours usually cover my dry patches! 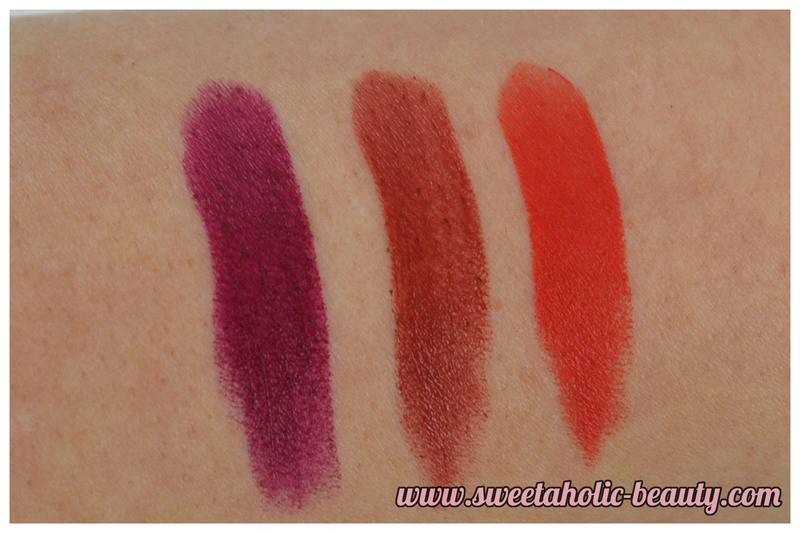 As you can see, these lipsticks are pretty pigmented. I was really impressed with Flirt Alert in particular. I also found that the colours applied really easily. The formula is creamy and oh so smooth, and didn't drag on the lips at all. My only issue I had was that the packaging is a little loose, so the lipstick actually goes back into the tube whilst applying. It can be a tad annoying unless you hold it right! Unfortunately these pictures aren't the best. I've been a little sick lately, and though I have been feeling better, my skin hasn't been so great! As you can see the two darker colours aren't as pigmented, and while this is only one coat, another coat would have made all the difference. Flirt Alert is more pigmented on first coat, but unfortunately up close it does show up my dry patches. Without dry patches though, this is definitely my favourite shade! 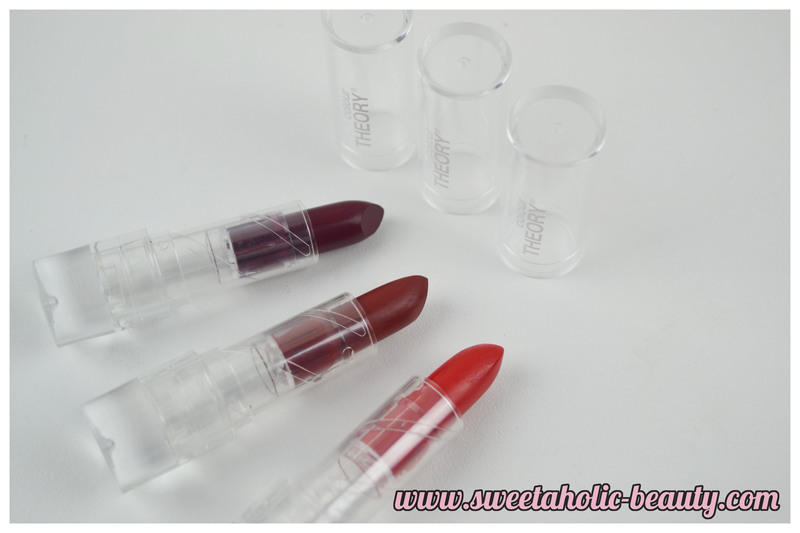 All in all, I'm absolutely in love with these lipsticks! These three colours are perfect for winter and will be worn again and again. Flirt Alert would also be a great all-year colour. 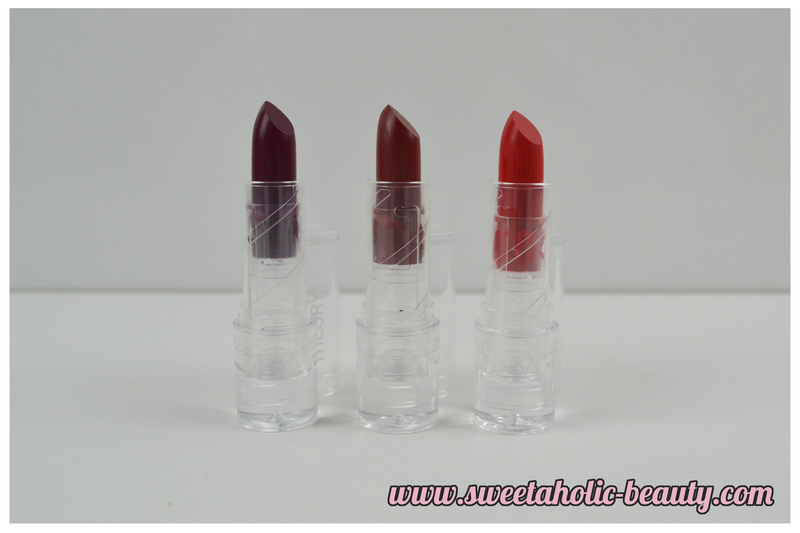 The lipsticks are great to apply, pretty long lasting, and absolutely gorgeous in general. Colour Theory can be purchased from selected pharmacies, and only retail for $6.00AU. An total bargain! You can find out more about Colour Theory here. 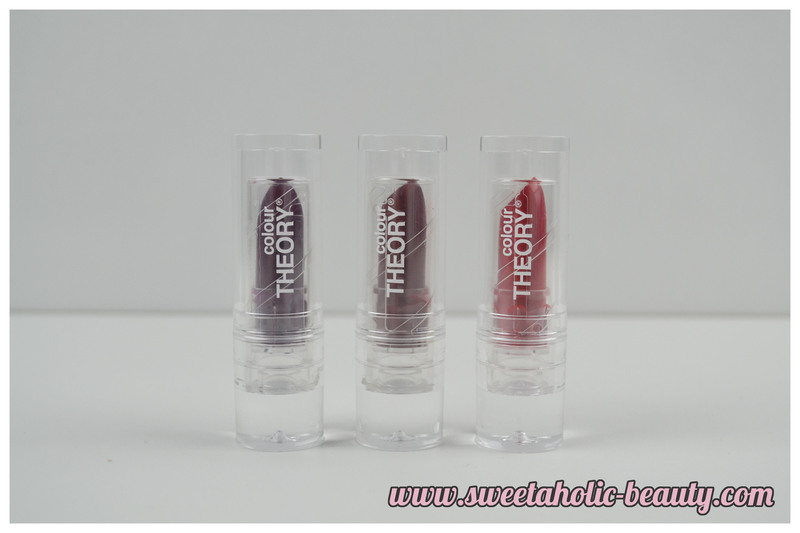 Have you tried Colour Theory lipsticks before? If so, what are your thoughts? Which of these three shades are your favourite? I have Autumn Ambition, Siren, Baarbie Girl, and Mystique but Violetta is my favourite - that really on-trend orchid looks great in winter, I think! I actually don't mind the packaging either, I like the white writing on clear packaging. They have a lot of quite bold shades so I might need to check them out since they're so affordable! Great shades for the dreary weather! The packaging kind of reminds me of the ELF lipsticks and they're a bit loose in their tube too. I love the packaging too! I actually really like the chunky plastic, and how it is see through. I love Autumn Ambition, such a good colour for the season. I'm not sure about the packaging, I'd probably need to see it on person to appreciate it. Which is a shame because I don't think there are any stockists in Canberra! Mystique is a very pretty purple, my favourite colour for winter (or anytime really) but I've already found my perfect purple. Maybe I'll check out the rest of the range if I can find a stockist next time I'm out of Canberra. Ive never seen these before but I really like mystique! I'm not sure how I feel about the packaging though. Such bargains though!! I saw these at Amcal but did not pick any up. Maybe I should get some colours. They are pretty cheap huh. Love the look of Mystique! If you haven't had the chance to yet, I highly recommend the eyeshadows from them! I've been meaning to try Colour Theory for ages, but I just can't find it anywhere! Must keep an eye out. As you may have noticed, I've been trying to 'train' myself into wearing darker shades for winter, I love dark shades on others but somehow think it looks odd on me! Aw no, I hope you find it soon! If I find a place that has a lot I'll let you know, if you want me to pick you up some! And yes, I have noticed, and you look FAB in darker colours! I can see these looking amazing on you! 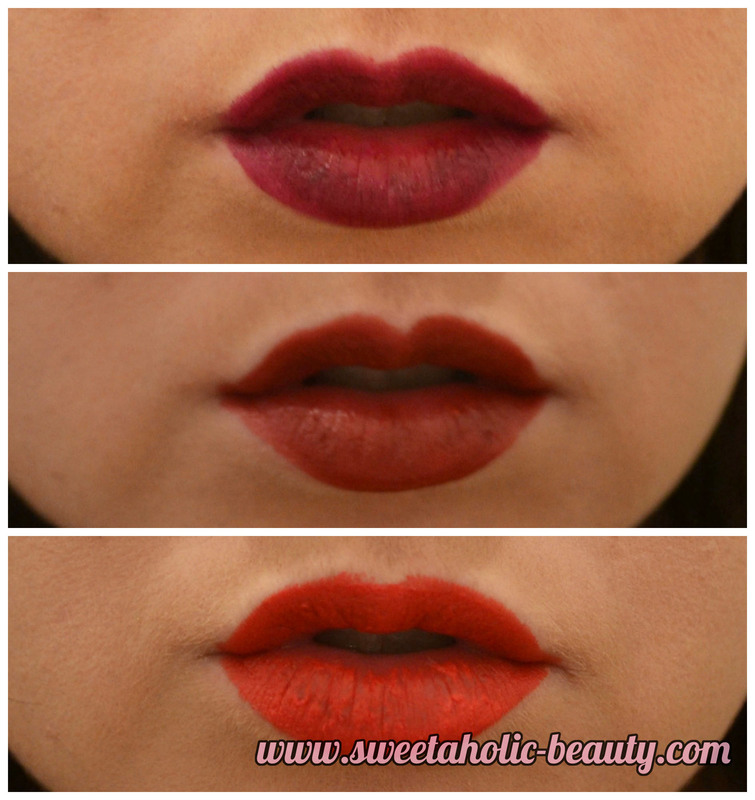 These colours are awesome, loving dark lips at the moment even though its summer here.